Artists have been using photographic reference material to paint from, since Victorian times. Even the PreRaphaelite Brotherhood used them, although theirs were of course, not in colour. Years ago, I read a book on the techniques used by the fantasy artist Boris Vallejo, and in it he demonstrated how he used studio photography as a basis for creating his oil paintings. This was long before computers became everyday items. These days it is easy to use very sophisticated art software in ways that take the “photo to painting process” to another level entirely. Vallejo generally employed models to be photographed in empty studio settings. He would later add his backgrounds from other sources. Often he would create mythical beasts from his imagination, that were based on his human models. I work in a similar way, but with modern computer art programs and a drawing tablet (currently a “Ugee”) I may easily combine the separate elements such as models, backgrounds, props and costumes into a single working image. I can even add imagined details over the top of my source photo, “painting” with my “pen” and tablet. This process is a boon to the modern day artist, and speeds up the thought processes towards creating finished paintings. It allows an artist to virtually “see” what any painting might end up looking like, long before he commits to canvas and real paint. Taking advantage of a fine evening, an hour or so before sunset (after leaving work), I placed my fake tree stump into the boot of my car and drove to some nearby woodlands. 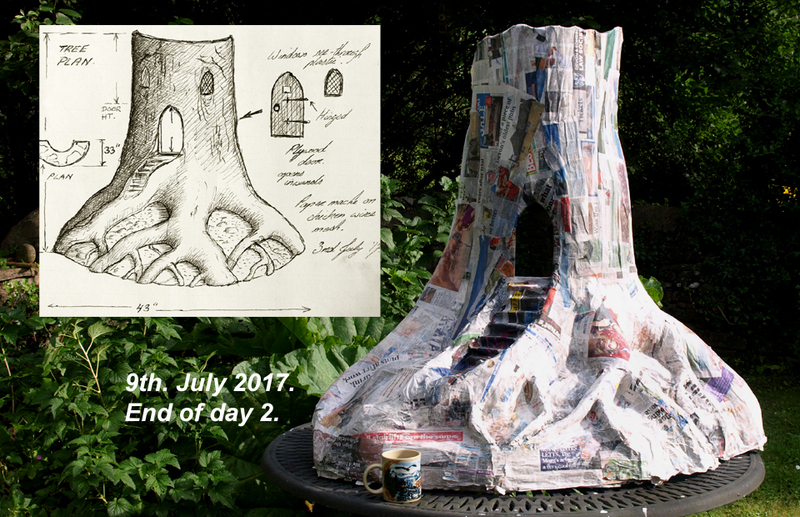 I looked around for a similar looking tree (although no Beech grew nearby, mostly English Oak and Sycamore), and propped my paper mache one up against one. 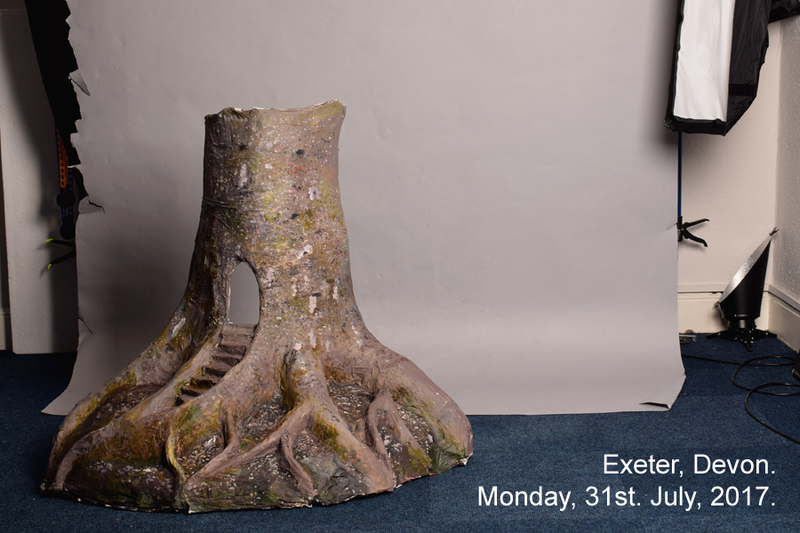 I carefully positioned it so that the rays of the lowering sun fell upon it at a similar angle to how the lights had previously lit my model H, in the Exeter studio. It was interesting to observe how the foliage of neighbouring trees cast dappled shadows across my tree’s surfaces. Later, in the PC, I, very hurriedly, cloned in some undergrowth between the roots. It all began to look quite real! However, this was me being somewhat impatient. I was eager to see the possibilities of composite photography, and how it might aid my painting reference. It’s partly about avoiding the copying of others work and thereby infringing copyright laws, but it is also about having complete control over what you are trying to create. However, there are far more picturesque backgrounds to be found throughout this land, and seeking out one or two of them, must surely be my next quest. So, the day of the planned photoshoot finally arrived and I took along some costumes, but model H added many more of her own. My costumes were very basic (economic), but I intended to elaborate upon these during post-processing work and in the painting stages later on. I hired H specifically for her dreamy, ethereal look, her innate grace, and her marvellous hair. She was very easy to work with and I came away with a good number of shots displaying very interesting possibilities. The studio background paper I selected, was a neutral grey, and almost unimportant, as my backgrounds will be added later of course, however, grey also has the least influence on natural skin tones. 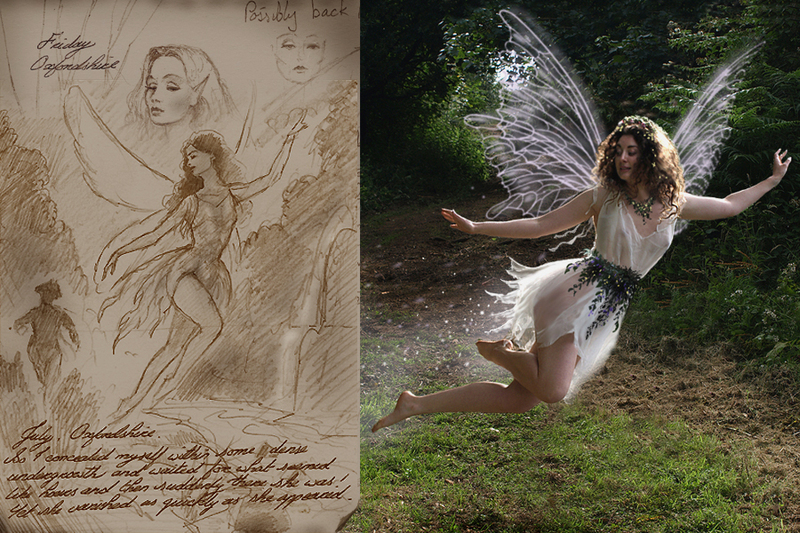 I am afraid that other non-art matters are pressing to be dealt with at present, so it might be some time before I actually start drawing and painting from these photos, but I am very excited now, and am looking forward to commencing my first fairy originals, perhaps when the Winter comes. I loaded my cameras, and my papier mache model tree stump, into my car. The tree fitted in easily, as I had noted the dimensions of my car’s boot before I began making the tree’s original wire frame. I drove to the photographic studios in Exeter, where owner ‘A.’ was very helpful in setting me up with the lighting I was looking for. I did some test shots of the tree alone, until I was happy with the lighting positions. I used a simple scheme, of a single strong source (coming from my right) plus a weak fill-in to kill the darkest shadows, hoping to emulate an outdoor low sun. I ran out of time to complete the details on the tree and so it had no door or windows, but these, I decided, could easily be added later in the PC. 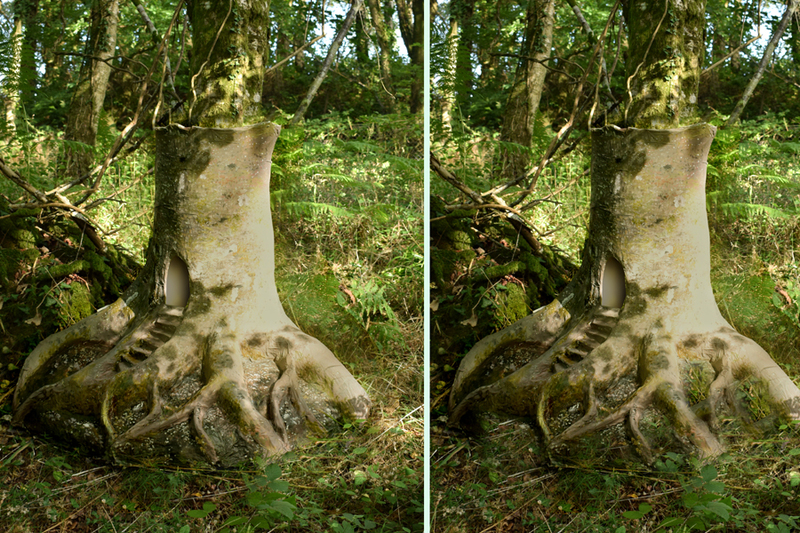 Prop Idea – A Fairy Tree. 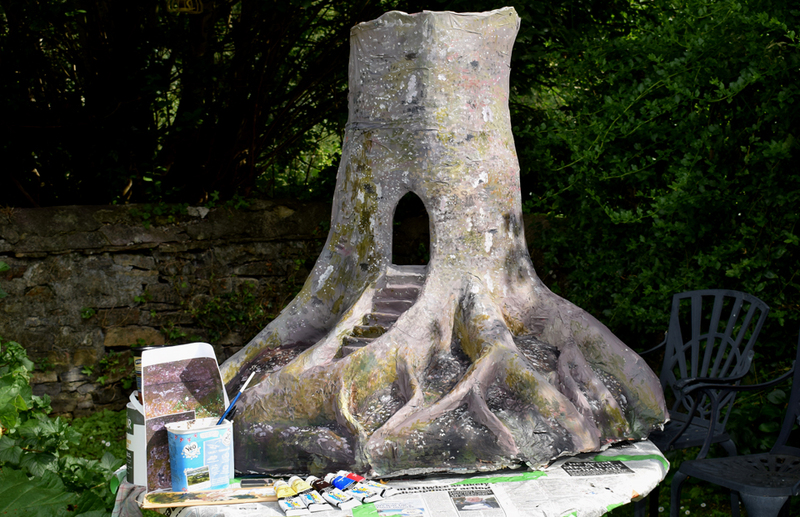 I am planning a model shoot, in a photographic studio, for the end of July, and, ideally, I should like to create, and incorporate this “fairy tree” prop. I will construct it using paper mache laid over a chicken wire frame. Will I be able to make it look very like my ballpoint pen idea, who knows? It has been a very long time since I made anything out of paper mache. Will I get it completed in time? Watch this space. 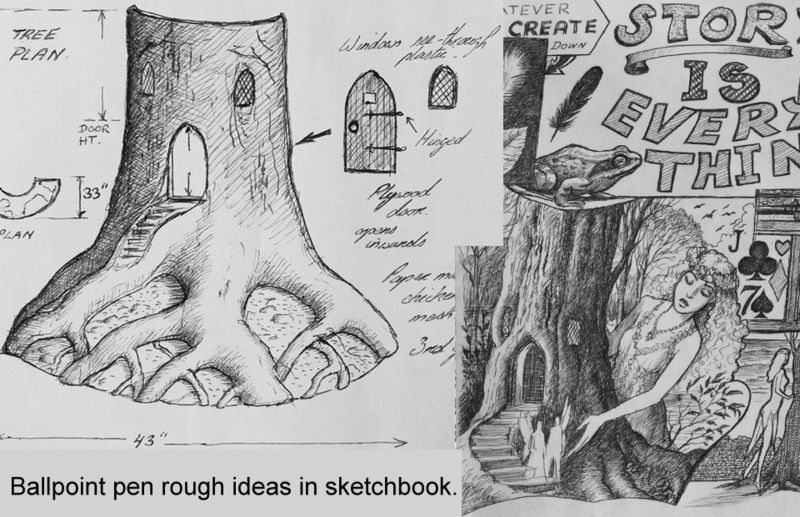 The basic overall idea that I am hoping to create, may be seen in my doodle on the right.